Since the last 2 weeks though I started suffering bad stomach pain, tiredness, headaches..... etc... again and this week it got so bad I haven't been to work since Wednesday and all I have done is sleep. I woke up late today as my niece didn't go to school either as she came back from school yesterday with a really bad cough which has got worse... she like me never took a day off . Well anyway with getting up late I knew I wouldn't get a doctors appointment so I phoned asking for a doctor to phone me, it was just after 11am... I rudely got told to phone back tomorrow. I told my mum and she told me to phone back and ask them what to do if they are not willing to let a doctor phone me. So I did, I got told that if I want an appointment or for a doctors call back I have to phone before 11am! I mentioned I had stomach pains, she instantly arranged it, the doctor phoned me by 3pm and I had an appointment for 4.40pm... and the disgusting thing was that the surgery was empty and there are probably people like me who needed to be seen! The thing is if you don't go to the doctors for some month like me and they change rules you never know about them as before you could get a doctors call back at any time of the day. I know you don't care about my medical history but I'll tell you anyway so you get a better picture.... Since hitting puberty I've always suffered from bad stomach pains, by the time I was 18 it was really bad, my mum even took me to the doctors and he told her I needed to lose weight so should eat boiled veg! I wasn't even as fat as I am now... By the time I was 20 it was even worse that I was having black outs whilst walking and one day fainted at work which resulted in me going back but this time seeing someone else who thought it was my kidneys. The kidney specialist accused me of being pregnant and being too scared to tell my parents.... if I was that wild in doing things I would have had the guts to tell my parents but I wasn't.... from this though I got called in for a scan as it must have come up as me being pregnant... in the scan the man doing it said something really unprofessional like oh my god... I was like what the heck.... he sent me to drink more water whilst he called a friend for a 2nd opinion and from there things got rolling so for my 21st I found I had a fibroid. Just before my 23rd birthday I had it removed... Despite all this I'm really grateful that I only had the one as some people have lots which continually grow and have to be continously removed, that would have been so hard for me as I found that one emotionally draining. In those 8 years though the stomach pain has never gone, its just at some points its been calmer then others. I go to the doctors when I can't cope anymore with it and usually I'm just sent on my way feeling stupid for even going... as I either get told its a viral thing, the doctor looks at me bored or they smirk at me. I always thought it was hormonal problems because of my fibroid but someone at work was diagnosed with Crohns Disease so I looked it up... I knew I didn't have that but realised I had some form of digestive problem even though IBS has been mentioned but I can't accept that as its such an easy thing to say as there is no cure and is really common... I would accept it if everything else had been ruled out first. I did my research online but found nothing that fit completely... the only thing that came close is Colitis minus the weight loss and bloody stools. I imagined a similar response to all the others today also, I told my mum before I went whats the point they won't even give me medication for it or even listen to what I have to say..... I was so wrong, she was a bit weird at first as she wanted me to talk and I'm used to the questions so I rambled on... she checked my stomach... almost had me screaming in pain as she pushed an area I didn't even know hurt and then she asked about blood test etc... and eventually listed all the digestive disease she thought possible, as well as asked for other things.... and now I need to give those tomorrow. 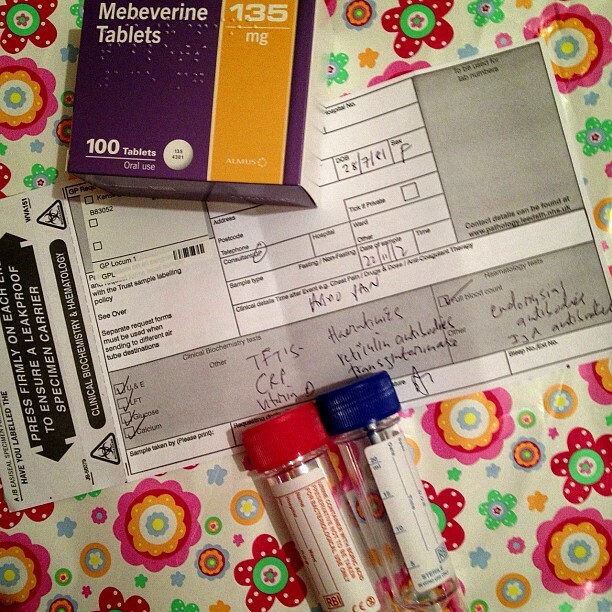 I'm hoping that 10 years later, I will have another closure in finding out what the problem is this time, it might hopefully get the ball rolling in some good luck this time (in me finding a house, a more satisfying job, children..) With my fibroid it was a closure but bought bad luck.... my grand-dad came to England for 6 months and that resulted in his never being able to go back until he died 2 months after I got married... he had Hep B which was dignoised here and they made a break through with his condition... my dad died 6 months after my operation... many other relatives have passed away.... I'll have to do a list of things I'm grateful for in those 10 years as I can't help thinking of all the nasty things in that time. I better stop as I know this has got to be such a long post.... Please keep your fingers crossed (or in your prayers) that something will come of this situation finally. Thanks! It means a lot, I am kind of used to it but this is the worst I've been since before my Fibroid... will have to see what the outcome is this time. That sounds horrible. I suffer from Ulcerative Colitis and my doctor in Germany said I am anorexic (thanks very much) so I never went back there, but suffered for a few more years. The tiredness, stomach pain, not being able to eat or keep food in. Then in Ireland I got diagnosed with UC - it was just a simple blood test. I felt relieved and stupid at the same time. I got loads of tablets it took a while but I am now much better. The tiredness was due to a lack of iron and since I got iron tablets/infusions I am way more bouncier. So I really hope they find out what is going on because it is horrible to suffer without knowing the cause! GP are just useless they don't seem to do simple tests to start with just to be sure... I always get the you're pregnant line, even before I'd have any kind of relationship and its just like really?! They'd have a lot less people turning up if they did their job properly and for some reason they seem to think giving people antibotics is the answer too. I'm glad you have been able to find out what was wrong with you and I hope its the same with me... especially after giving about 8 bottles of blood today. Oh man, I'm sorry to hear that things only got worse so far =.= And I can't believe how useless those doctors are who are basically too busy to bother to really check what's wrong with people! I'm crossing all my fingers and toes and hope that that doctor is a good one, finally! Lately I had a doctor GOOGLE my condition! This is so ironic =.= I hope you'll feel better soon!! I have a friend who recently found out she has Celiac disease after 10 years of dealing with what she was told was just ibs. Even though it meant quite a lot of changes for her she was SO happy to finally have an answer. I really hope you get an answer to this soon too. Thank Pikaboo, I hope there will be some outcome in all of this.